AMMAN, Jordan, 11 July 2017: Over 3,000 children have begun attending a Summer School programme established by the Ministry of Education and supported by UNICEF. The programme particularly targets children who were previously out of school, and only enrolled for formal education when the Ministry of Education re-opened registration in the second semester, between January and March 2017. The Minister of Education, H.E Omar Razzaz stressed that the Ministry of Education, in line with the Government of Jordan’s priorities, continues striving to provide education opportunities to all school children, including Syrians, along with their Jordanian peers and appealed to the international community for continued support. Having missed the first semester, the Summer School programme assists these children in receiving additional schooling on all subjects appropriate to their grade, to fully complete a full academic calendar. Successful completion of the programme allows them to progress to the next grade level, when the new school year begins in September 2017. The programme will run for six weeks in 45 public schools located across the country, in towns and urban centres, and Syrian refugee camps. The curriculum includes all subjects taught during the scholastic year in the Kingdom’s schools. “UNICEF welcomes the Summer School initiative by the Ministry of Education which is another great step towards realizing the vision of all children in Jordan reaching their full potential,” said the UNICEF Jordan Representative Robert Jenkins. “We are grateful for the continued commitment of the Government of Jordan and the support from donors in improving access and quality of education for all children in the Kingdom,” he added. The Ministry of Education and UNICEF collaborated to bring back experienced teachers to manage the summer school programme. Additionally, the programme is providing school supplies, learning materials, food and transportation for students and staff. Over 126,000 Syrian children enrolled in public schools in Jordan during the 2016-2017 academic year. 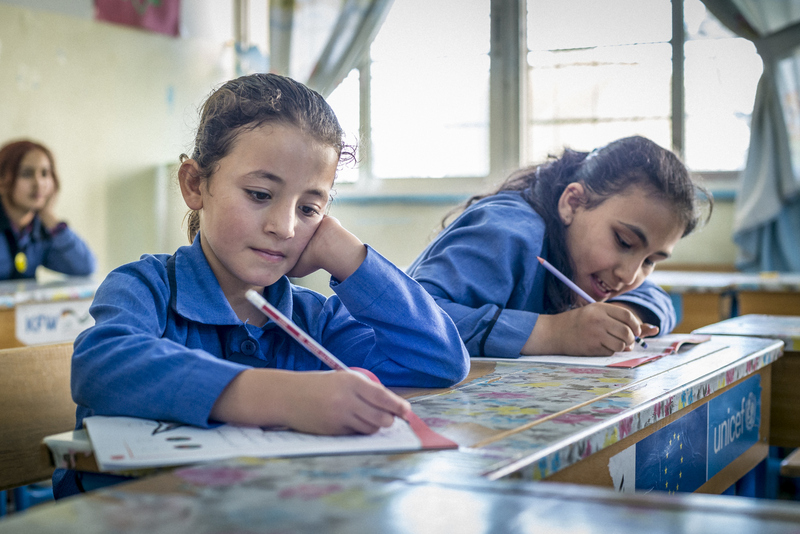 The Ministry of Education and UNICEF, will continue striving through the ‘Learning-For-All’ (L4A) campaign to ensure every child in the Kingdom is enrolled in school and learning. Back in September 2016, the Ministry of Education opened afternoon shifts in an additional 100 schools, bringing the total to 198 double shifted schools to accommodate as many out-of-school children as possible in the formal education system with support from UNICEF and donors including Canada, the European Union, Germany, Netherlands, Norway, UK, and the US. The Ministry of Education also started the Catch-Up programme, enabling children aged 9 to 12 years, who have missed more than three years of schooling, to enroll for ‘fast track’ learning programme, assessed and, and join the age-appropriate class in the formal education system. In addition, children above 12 years can enroll in the Non-Formal Education programme. UNICEF supported the initiative with a nationwide Learning-For-All campaign mobilizing civil society partners, and managing an education hotline, to spread awareness and encourage parents and caregivers to enroll their children in schools. The Summer School programme started on 2 July 2017 and ends on 24 August 2017. Classes will be held for 46 days – six days a week including Saturdays from 8:00 am to 2:00 pm. The curriculum for grade one to eleven includes all subjects similar to a regular semester, with the addition of a sports session for each grade.